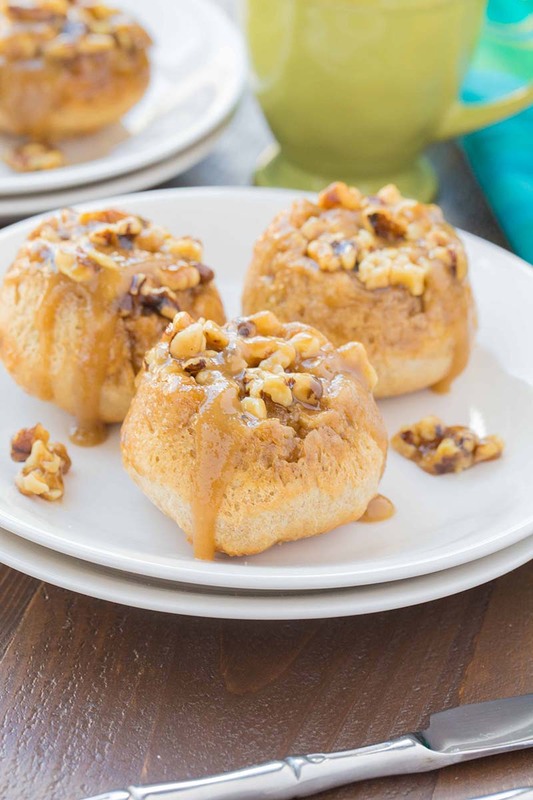 Apple juice and cinnamon in a one-rise no knead dough, topped with caramel and chopped nuts. In large mixer bowl, combine 1¼ cups flour, yeast, sugar, cinnamon and salt; mix well. In saucepan or microwave-safe dish, heat apple juice, water and butter until warm (120-130°F; butter does not need to melt). Add to flour mixture. Add egg. Blend at low speed until moistened; beat 3 minutes at medium speed. By hand, gradually stir in enough of remaining flour to make a stiff batter. Prepare Topping: In saucepan, combine brown sugar, butter and corn syrup; heat and stir until blended. Add nuts. Spoon topping into greased muffin pan cups. Spoon batter over topping. Cover; let rise in warm place until double, about 45 minutes. Bake at 375°F for 15 to 20 minutes until golden brown. Cover pans with foil and invert onto rack. Cool one minute; remove pans. Cool. Recipe featured at My Kitchen Craze.